Although at the moment paid-for wi-fi is available at various hotels and restaurants in the area, at 5,380m (17,600ft) it is expected to be the world's highest free wi-fi zone. This trek is designed to fulfil the dream of many adrenaline-seekers to experience the historic route to the base of the world's highest mountain. After a slow ascent through picturesque Sherpa villages, visiting traditional monasteries and enjoying the spectacular scenery, the trip culminates with a fine opportunity to trek to both Everest Base Camp and the nearby peak of Kala Pattar for spectacular views of the mighty Mount Everest. 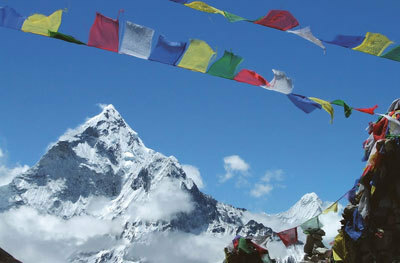 Not sure which Everest trek to do? This high-altitude, three-week traverse of the entire Everest region provides all the highlights you would expect (with a mixture of local villages and Sherpa culture), including crossings of the Kongma La, Cho La and Renjo La; ascents of Kala Pattar & Gokyo Ri; and a visit to Everest Base Camp. Nights are spent in a combination of wilderness camps and World Expeditions' exclusive private eco-campsites, as well as handpicked eco-lodges. This innovative itinerary (the shortest Everest Base Camp trip currently available in the market) allows for the typically 17-day route to be completed safely in just two weeks and is especially designed to appeal to adventurers limited for time. To reduce the length of the trip, instead of using dangerous shortcuts or compromising on the acclimatisation phase and the travel experience, it utilises at the end of the trek a helicopter flight as opposed to returning on foot from Lobuche. For more information and bookings, visit worldexpeditions.co.uk World Expeditions' policy ensures there are no local payments. Prices do not include international flights, however these can be arranged on request.